Efficiency: quickly generate outputs for multiple formats and end-users, all in one place. Scaling: easily manage growing content for multiple formats, end-users and languages. Quality: reduce errors by editing one master source file and automatically updating all outputs. Lower ongoing costs: save time and money by updating one master source file instead of hundreds of outputs. 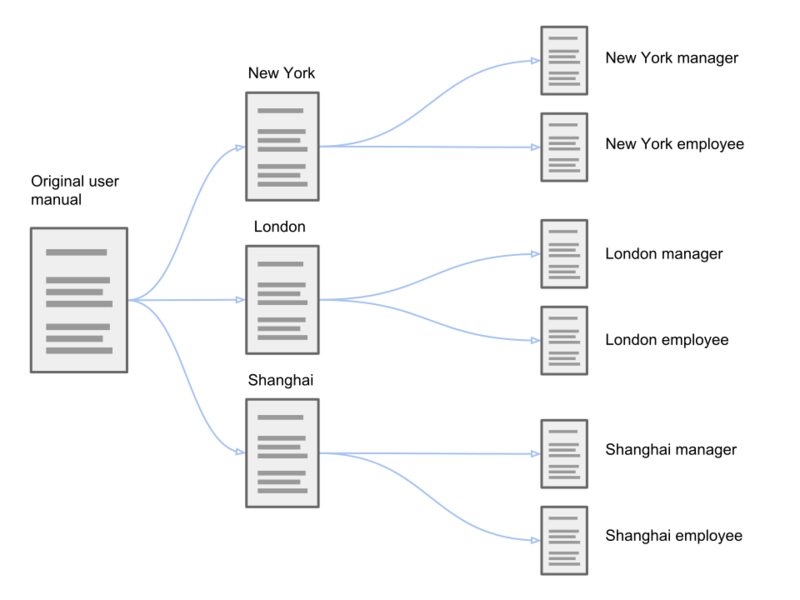 What is single source publishing? Single source publishing is a content management concept that allows you to create content once and publish it multiple times across multiple formats. It allows you to customize the way your content will appear on a website as opposed to in print, and to customize what content will appear for different types of readers. 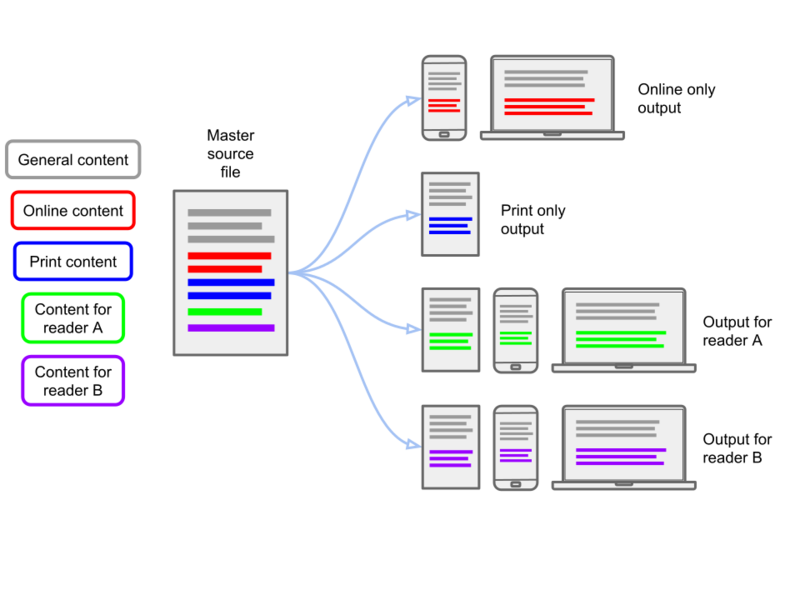 Keeping all of your content in one master source file saves you time. Instead of creating content for every output you want to publish, you can easily generate it all from the master source file. All you need to do is decide how you want the content to appear and what needs to be included. Imagine you are writing a sales paper and want slightly different content in print and online. You also want different types of customers to read different information. With single source publishing software, you can write all of your content in one place, the master source file. Then you need to “tag” which content is for which outputs and readers. When you tag a piece of content, you are telling the software where this content should appear when you output it. Related: How Deep Does Localization Go? Once your content is written and tagged, you need to output it. By using tags, outputs will be automatically generated for the correct reader and format. This prevents the need for writing new content for different readers or maintaining multiple versions of your content for different formats. How does it help with content management? When using single source publishing software, all of your content is stored in the master source file. This allows content management to become automated, saving you time and money. Imagine you run a business with offices in New York, London and Shanghai. You have just implemented a new online HR system and have written a user manual for it with conventional word processing software. You discover that users across the different offices will use the HR system in a slightly different way because local employment laws are different. You write a slightly different user manual for each office. You now have three different user manuals. You then discover that managers and employees use the HR system in a different way and need a different user manual for both. Each office requires a slightly different user manual for managers and employees and you now have six different user manuals. After a year of using the HR system, a new function has been added and the user manuals need to be updated. You have been using conventional word processing software and must update six user manuals manually, wasting many man-hours. Now imagine there were more offices, more types of users and multiple formats to publish to. The content you have to manage could quickly get out of control, time will be wasted and errors are sure to creep in. Single source publishing to the rescue! By keeping all of you content in one master source file, you only need to update it in one place. Updates are automatically pushed out to every version of the user manual when you generate outputs. By tagging content in the master source file as being for certain users, offices or formats only, the required content will automatically appear in your outputs. You don’t need to maintain different versions of user manuals and waste man-hours updating them all every time something changes, just update the appropriate content in the master source file. 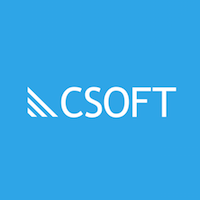 CSOFT’s Global Communications team is experienced in building content from the ground up for international organizations with industry-standard single source publishing software. Our team of expert writers can help you to overcome the challenges of moving your content to single source publishing software and avoid the steep learning curve associated with it. Once your content is created, our writers can manage any updates or changes and create outputs for the correct end-user and format.